Social > Planning a boating trip? Check the weather before you go! Planning a boating trip? Check the weather before you go! If you're preparing to head out on the water this summer, check the Bureau's round-the-clock forecast service for all Australian coastal waters. There are five things to take note of when planning your boating trip: warnings, weather, wind, wave and tide conditions. Warnings are the highest priority forecasts. They warn of potentially dangerous wind conditions expected during the next 24 hours. Winds of 26 knots or more indicate rough conditions for small boats. Our coastal water forecasts provide information about conditions that may affect safe boating. It is also worth checking adjoining land forecasts as these provide more information about general weather conditions. To plan your trip for the best conditions, look for forecast trends in wind speeds and shifts in wind direction over the day. Forecast winds are average wind speeds, with gusts being up to 40 per cent stronger. Also take note of swell and sea wave conditions and how your boat reacts to short, sharp sea waves against longer and flatter, but more powerful, swell waves. Swell waves don't enter enclosed waterways, but do have a dramatic effect on entrances to these areas. Enclosed waterways are affected by sea waves – waves produced by the wind blowing across the region. A sea height of one metre can create enough chop to swamp a small boat. For coastal waters, you need to consider swell and sea waves. Swell waves can be of considerable danger near reefs and breakwaters. The combination of sea and swell heights indicates the wave conditions you may experience. But you can't just add one to the other. For instance, a 2.5 metre swell and 2 metre seas results in wave conditions over 3.2 metres. See how to calculate combined sea and swell height. 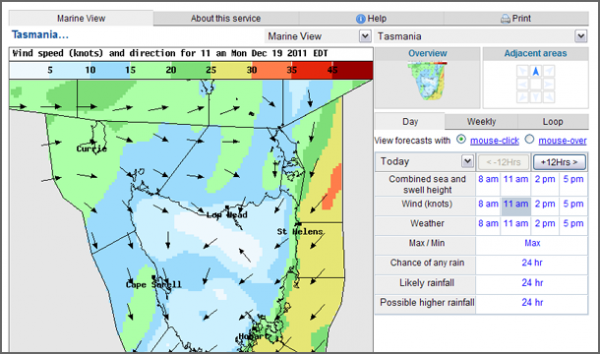 Marine Forecast Explorer™ displays graphical forecasts and seven-day forecasts for any point (currently only available for NSW, Victoria and Tasmania). You can access our marine website using 3G mobile coverage if you're close to the coast. Forecasts are also provided by VHF and HF radio broadcasts. See our Marine & Ocean Communication Services page for more information. See our Marine & Ocean Check the weather before you go out on the water page for more information. Happy boating from the Bureau of Meteorology! 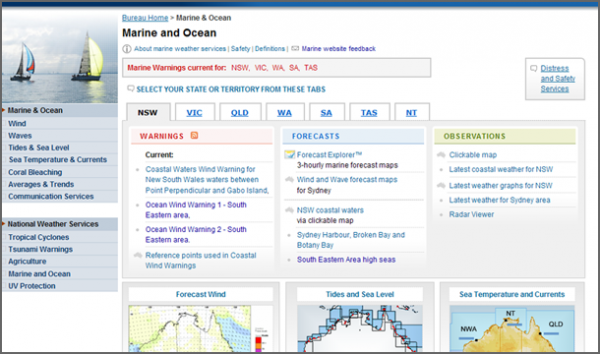 Marine Forecast Explorer™ for New South Wales, Victoria and Tasmania.